389 pages | 70 B/W Illus. Environmental concerns and a demand for sustainable chemical production have become important issues in recent years. As a result, microbial biosurfactant-producing systems are gaining momentum as potential replacements for chemical surfactants. 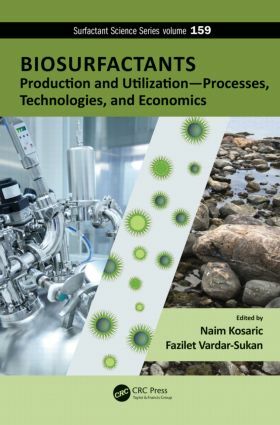 Biosurfactants: Production and Utilization—Processes, Technologies, and Economics explores the production, utilization, and industrial/economic use of biosurfactants in modern biotechnology. This book represents comprehensive material developed by contemporary experts in the field. Focusing on research and developments within the last 20 years, it highlights relevant changes in the industry. It provides a detailed account of the current applications of biosurfactants, considers the potential for further environmental, biological, and industrial applications, and concentrates on surfactants and organisms with possibilities for future use. Factoring in the industrial application of biosurfactant production based on renewable resources, the book determines how biosurfactants can enhance or replace the properties of chemically synthesized surface-active agents. It discusses moving beyond the laboratory scale of research and development and on to the industrial scale of commercial interest. Biosurfactants: Production and Utilization—Processes, Technologies, and Economics contains special sections devoted to the overview and evaluation of specific patents relating to biosurfactants, and methods for production of biosurfactants on a laboratory and industrial/commercial scale. It also presents novel and proven applications for biosurfactants from a number of biotechnology laboratories and research facilities around the world. In addition, it introduces the reader to a variety of real-world industry techniques readily applicable for practical use. "… focuses on the potential use of biosurfactants in various industries. With contributions from the last twenty years of biosurfactant research, the authors consider both existing uses of biosurfactants and possible future applications. Experts in the field consider specific topics including regulatory processes, commercial production, cost analysis and the potential use of biosurfactants in food, cosmetics and pharmaceuticals. The book will be of interest to both graduate students and researchers in the fields of chemistry, pollution control engineering and economics." Naim Kosaric is emeritus professor of chemical and biochemical engineering at Western University, formerly University of Western Ontario (UWO), London, Canada. His more than 30 years of research at UWO has focused on biotechnology. Within his extensive published work (more than 350 scientific papers), numerous projects and publications were also on microbial surface active agents (biosurfactants). Dr. Kosaric received his Dipl. Ing. Degree (1955) in chemical engineering from the University of Zagreb, Croatia, and his Ph.D degree in biochemistry (recipient of the Collip Medal for most meritorious Ph. D thesis in medical sciences, 1970) from the University of Western Ontario. Fazilet Vardar-Sukan is a professor in the department of bioengineering at Ege University, Izmir, Turkey, and is the founding head of the department. She received her chemical engineering degree from Ege University (1978) and her Ph.D degree in biochemical engineering from University College London, UK (1981). She has 30 years of teaching and research experience and has over 100 publications in bioprocess engineering focusing specifically on scale-up, mass and momentum transfer in bioreactors, and re-utilization of agro-industrial wastes and surpluses for the production of high-added value materials. She is also a recipient of the TUBITAK Incentive Award (1989).